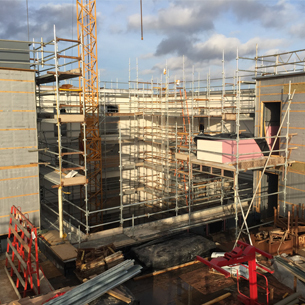 Work on the Causewayend student accommodation scheme has now topped out and is well on the way to completion. Good progress is being made on the brickwork facades, the fitting of windows and the internal MEP. Each studio unit will be self-contained with it’s own fully equipped compact kitchenette, en-suite WC/shower room, bed and study area. The highly sustainable design will include a glazed central light well that will enhance the communal ground floor spaces that will comprise of social break out areas, reception, FM office, laundry and cycle storage. Construction of the accommodation is scheduled to be complete in Summer 2017.